This is the report of that "rescue party," led by Lt. C. J. O'Shea. It describes an exceptionally difficult rescue operation whose members almost ended up like the captured aviators. Notably, the rebels' killing of Thomas & Dowdell infuriated the Marines, while also absolving them from treating the Sandinistas as a belligerent force as defined by the 1907 Hague Convention. In effect, from the perspective of the US military, the laws of war (as then defined and internationally recognized) no longer applied to the Sandinista rebels, and the fight soon devolved into a brutal war without quarter. To: The Commanding Officer 5th Regt., Managua, Nicaragua. 1. At about 11:30 a.m., Saturday 8 October, word was brought here by plane that Lt. Thomas and his observer had crashed into the side of a hill near QUILALI and that both were unhurt. A Ham map of Nicaragua was also dropped to me showing the location of the plane which indicated it to be about 3 miles NW of QUILALI. At that time there was a patrol of ten men enroute from here to OCOTAL, with all our good saddle animals. A mounted guard immediately were asked to intercept them. They returned to Jicaro at 3:30 p.m. with the animals in a worn out condition due to their haste in returning, so that they would have been useless for a long patrol had I waited for them. 2. Meanwhile realizing that haste was important since the aviators were in grave condition danger, I took 8 marines (all the available men able to stand the trip), 10 guardia nacional, and Dr. J. B. O'Neill (since I believed it likely that the aviators would need medical treatment), borrowed four horses and one mule, and with 3 days rations proceeded at 12:45 p.m., by forced marching toward QUILALI. At 7:00 p.m., reached a point 7 miles NW of QUILALI, having marched 18 miles, and halted for the night. The men were at that time in an exhausted condition, 6 of the marines and several of the Guardia being weakened by a recent attack of malaria. Had I had more exact information as to the location of the plane and the road to follow, I would have rested a few hours and pushed on that night. Before leaving JICARO I had told the men that I expected to have to fight to get to the plane, but I expected to reach there before any great number of the enemy could assemble. 3. At 6:45 a.m., Sunday, 9 October, proceeded toward QUILALI and at 8:00 a.m., reached a point 3 miles NW of QUILALI. Could obtain no information of a plane from inhabitants and therefore halted and waited for the planes to arrive. When planes arrived they indicated for me the area where the wreck was located. It was about 3 miles N of us in a direct line, but in order to reach it we had to make a long circuit marching back about 3 1/2 miles and then following a ridge of difficult mountains. It took 3 1/4 hours marching to reach the place and meanwhile the planes had to leave us because of shortage of gasoline. 5. Considered that if we went forward we would be completely cut off and that our ammunition would soon run out. Directed no automatic fire, to save ammunition. Decided to turn back and fight our way thru the smaller force. There were about 100 of them occupying the hill and the road we had just come over, and we could hear more coming in the distance, yelling as they came. We attacked this band and drove them over the hill. Rifle and hand grenades were of great assistance. We received heavy fire from our rear during this attack, and Sergeant Porfirio Melendez, GN, was shot through the head and instantly killed. A dynamite bomb exploded halfway between PFC R. H. Welch and myself, who dropped back of his own accord, waited for a rush from our rear, and broke it up with a hand grenade, probably killing three or four. Pvt. McKenzie who was assigned to guard the rear, dropped behind farther than was necessary and killed three with his Thompson gun. One of these obviously was a leader. Cpl. Neel accurately placed rifle grenades where groups of enemy were ahead of us and materially assisted in clearing the way. I was leading with the hand grenades, and since the brush along the road seemed to be full of the enemy it was necessary to throw them only a short distance. At one time while trying to pull a pin from a grenade Pvt Struck shot and killed a bandit who was sighting in on me about 10 yards distant. 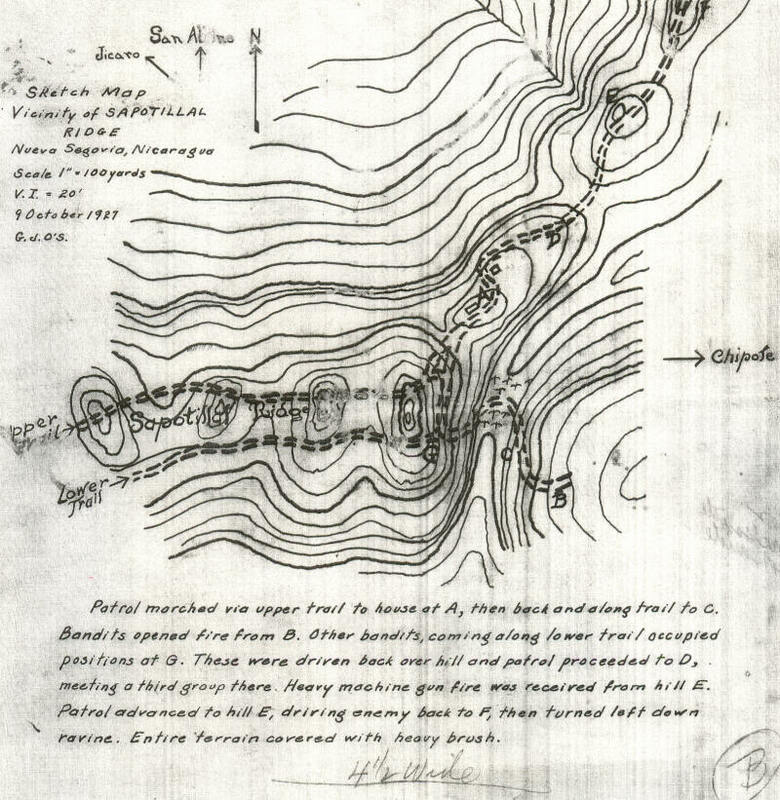 In the hollow between the 2 hills Pvt Green killed 2 men hiding in a banana grove and wounded a third, all of whom had dynamite bombs in their hands. The guardia behaved splendidly. One of them continued to fire his rifle after half of the barrel had been blown off. The entire patrol were cool and deliberate in their actions, advancing under cover where possible and taking careful aim before firing. 6. In that manner we got out from between the two bands and they ceased firing. 1 horse with rations, 1 loaded with blanket rolls and a horse and mule with saddles were killed. 1 horse remained. We took a trail leading about north which would run into a road for SAN ALBINO. Proceeded about 200 yards and encountered another band of about 75 marching toward us, who were evidently reinforcements coming in. We were on a slight rise and halted. They attacked immediately. 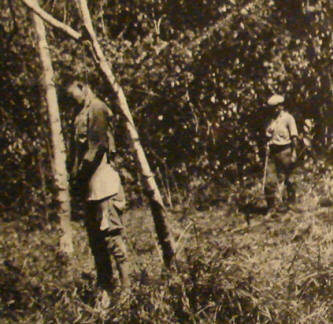 The trail was narrow and the brush thick on either side, so that it was not impossible to deploy, and Dr. O'Neill, Pvt. Golak and myself received and broke up the attack forcing them to retreat to the next hill. The bandits to our rear had reorganized and were closing in. Believing that our only way out lay ahead, decided to push forward. Dr. O'Neill at his own request led this attack. We were held up by a heavy machine gun fire until a rifle grenade killed the machine gunner. Pvt. F. Gutierrez, GN, was shot thru the forehead by machine gun. Pushed forward about 200 yards. The enemy hid in the brush as we advanced and fired from very close range. Dr. O'Neill and Pvt. Welch had taken a rifle and belt from a dead Guardia and killed at least two during this advance. Pvt. J. Benavides and L. Bustos, GN, were killed, one shot thru heart and the other thru the stomach. 7. Halted after advancing about 200 yards and hearing additional reinforcements coming for the band ahead of us, decided as a last resort to take to the brush. Had hesitated to do this because of the thick brush, the danger of becoming split up and lost, and our unfamiliarity with the country. Our guides had left during the fight and I had lost my compass. 9. Estimate distance traveled by this route about 30 miles. The difficulties of travel cannot be accurately described. At times we had to leave the stream and cut our way over steep hills thru heavy brush, to get past a bad spot in the stream. Were without food from 5:00 a.m., the 9th until planes dropped rations the afternoon of the 10th. We arrived in JICARO suffering from exposure and complete exhaustion, bruised, cut up by thorns and bitten by insects. Believed that there was great danger that enemy, traveling by road, would intercept and cut us off. 10. A very conservative estimate of the total number we engaged is 400 and it is believed that it may have run over that number. During both phases of engagements we were under very heavy fire and it is a miracle that we did not suffer more casualties. That the casualties were all Guardia cannot be explained in any way, as they fought side by side with the marines and were equally exposed. 11. A fairly accurate count of the number of enemy known to be killed or mortally wounded, brings it to about 40, and this does not include any estimate of the casualties from these hand and rifle grenades whose effect we could not see. I believe that 55 or 60 would be no exaggeration. 12. Every marine and every Guardia did more than his share, and every one of them did something exceptional. 13. Separate recommendations for awards for bravery will be submitted later, and I believe that this group of eight marines and six surviving Guardia deserve the reward of a decoration as much as anyone every before deserved it. The arms of the revolution on this memorable date have covered themselves with glory. The adventurous pirates once more have bitten the dust in our aggressive mountains, because our powerful con-cons and excellent marksmanship of our excellent riflemen will let the civilized world know the cause which is defended with sacred justice and legitimate right, omnipotent God will fight our cause and conduce us toward success. Once more the cowardly punitives who in the air make motions of greatness because they have the advantage that in the airplanes they pilot they assassinate cravenly our peaceful countrymen, have suffered a defeat today at 10 am after trying to fight with a small guerrilla expedition around the zone of Quilali under the command of the valiant captain Abram Centeno. The two airplanes made evolutions in the air after a strong bombardment with machine guns and bombs and were of the apparatuses falling in our power also one of the aviators and the mechanic who threw bombs. Said aviators being captured there were judged by a Council of War and shot summarily, applying to them the same law that the adventurer Feland wanted to apply to the patriot and legitimate Nicaraguan General Augusto C. Sandino when he made him an outlaw in his own country.